Whether it’s an online course, a blended class, an hour-long workforce training or a two-minute skills video, Freedom Learning Group’s unmatched team of U.S. Military Spouses and transitioning Veterans with advanced educational and professional experience stand ready to work with your stakeholders and build your content from a primary learning activity to professional certification preparation. Our team, which includes instructional designers, technical programmers, writers, editors, videographers, animators, and voice talent, can assist with product conceptualization, transition from print to digital, creation of formative, summative and high-stakes assessments, 508 compliance, creation of alt text for images and video transcription, OER curation, adaptive learning, personalized and project-based learning, competency-based education and provide subject matter expertise on almost any topic imaginable. Every project has its unique challenges. Freedom Learning Group’s value is building trust. Our multi-layered accountability methodology is essential for any great collaboration. And it is this trust—this commitment to quality and can-do team spirit—that have been the driving forces of our successful client partnerships. We assemble a response team and handle all the hiring, managing and paying processes, all overseen by a single-point-of-contact project manager. 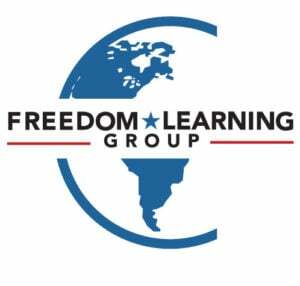 If you have a tough educational challenge, Freedom Learning Group will craft the optimal solution, utilizing the most dedicated workforce in the world. Discover the Solutions Freedom Learning Group has to offer.